Duration/Cooldown: This is active at all times. The Earth Grudge Fear is a secret kinjutsu of Takigakure which transforms the user's body into something similar to that of a rag-doll's, held together by hundreds of thick black threads. Kakuzu, who stole the knowledge of this technique before his defection from Takigakure, was able to manipulate black threads for many purposes. He was capable of sewing up any injuries that he or others might suffer, commonly by reattaching body parts; this ability seems to instantly reattach even nerves and muscles, as the patients could instantly move their limbs without any other complex procedures right away. However, it appears that this ability is somewhat limited, as he warned Hidan not to move his head too much after he had sewed it back on, saying that it might fall off again. He could detach parts of his limbs and then manipulate them, to the point that he could even send them underground and then reattach them when he was done with them. The most significant aspect of these threads is that they granted Kakuzu a form of immortality, although he declined to think of it that way. In addition to sewing up his injuries, he could use the threads to tear into a victim's body, steal their still functioning organs, and integrate them into his own body, thus extending his life. Kakuzu usually used this method to steal hearts from powerful shinobi, and was able to store up to four spare hearts in his body at any given time, meaning that all hearts must stop functioning in order for Kakuzu to die. He can also put one of those hearts into his limbs and have them move individually, as seen when he used his hand to remove a shadow-enhanced trench knife that prevented the rest of his body from moving. 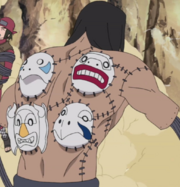 The extra hearts in Kakuzu's body are normally stored in various animal masks that were sewn onto his back, granting him vast amounts of chakra and numerous elemental affinities. He could detach these masks and have them take on a body of their own, composed entirely of threads. Ino Yamanaka commented the masks gave off a bad chakra. These masks were capable of attacking separately, unleashing devastating blasts of elemental chakra. 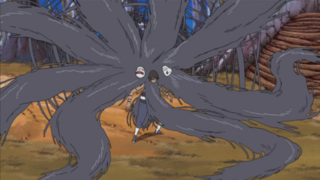 These threads could also compact together to form a spider-like body around Kakuzu, allowing him to fuse the attacks of his masks together in order to increase his attacking power. Kakuzu's animal masks contained his spare hearts. If he took use of the heart for himself, the corresponding mask would shatter upon the creature's reentry into Kakuzu's body. The User is forever changed when learning this technique. Their body is held together and manipulated through the control of hundreds or thousands of black threads. This allows them to survive almost any attack as they are capable of simply stitching themselves back together. As the wiki says the threads even repair muscles and nerves allowing immediate use of the limbs. The user is also able to separate parts of their body and manipulate them with the threads or just manipulate the threads themselves. THE THREADS HAVE NO NATURAL SHARPNESS. A seperated jutsu must be made to give the threads sharpness. This does not increase the users stats at all but the range of the manipulation is up to 5 meters. Organs and other things can be harvested to replace old ones and to extend the users life, but the heart of the opponent is what gives a bonus to the user. By stealing a players heart and assimilating it into the body the user is able to use ONE element that player had, even advanced and clan specific elements. The users body can maintain 5 hearts. Their own as well as 4 others. the extra hearts take on a mask and are positioned on the users back. Should the user need to use one of the hearts other than their own, such as their own is destroyed, they can assimilate one of the other hearts losing that hearts element and shattering it's mask. The only way to kill the user is to destroy all it's hearts. Heart beast constructs will be a separate jutsu. 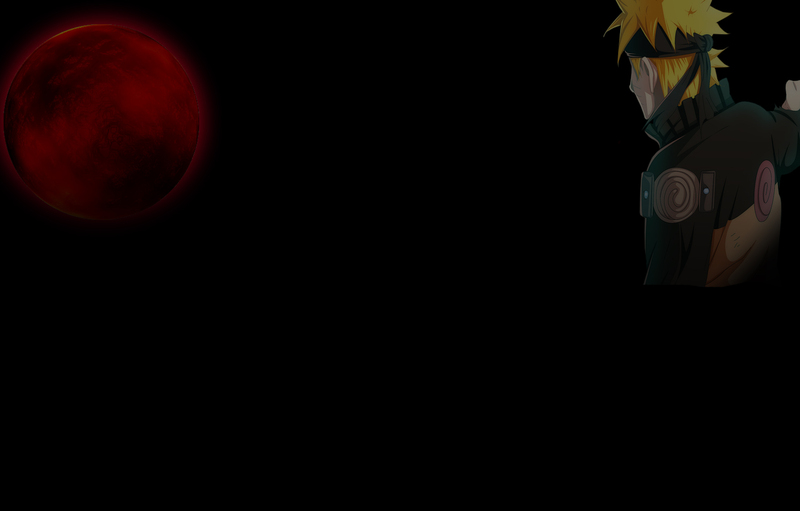 Bonus Requirements: Complete the kinjutsu mission and claim on the limited list.